Howdy all! 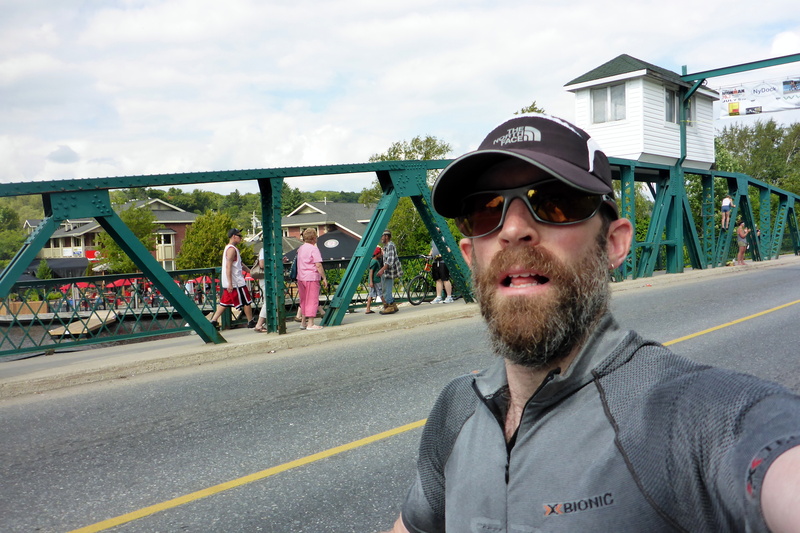 The title pretty much gives it away, but in case there was any doubt, this post will go over my recent race experience in the Muskoka region as I tackled the inaugural Ironman Muskoka. As some of you may be aware, this wasn’t my first time racing in an “iron-distance” triathlon, but it was my first taking part in the big corporate machinery known as World Triathlon Corporation, the group that puts on all the Ironman races globally. Ironically, in the week before the race, the entire corporation was actually bought out by a Chinese company. So I guess in a way, my Ironman standing was now ‘made in China!’. At any rate, this would be my 3rd full iron distance triathlon (almost 4, but the last one featured a half marathon instead of full marathon for the run. For the uninitiated, an Ironman is a swim, bike, run race, in that order. The distances are not inconsequential either. The swim is typically 3.8km in length, the bike is 180km, and the run is a full marathon, 42.2km. The events are done in order, in a non-stop fashion, on a marked course. There is an absolute time limit of 17 hours to get it done, and some intermediate cutoffs (that really just take people off the course if it is clear they’d miss the cutoffs. 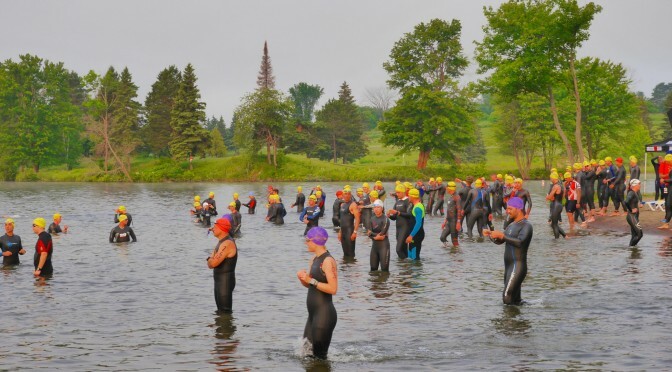 Between each event you head to a transition zone to change your gear. In addition, many say that nutrition is the 4th leg of the event. Staying hydrated and properly fueled throughout the day is a big challenge to many. They say over 50% of competitors will experience some form of distress arising from challenges in either nutrition or hydration. If you’re wondering about my preparations for this kind of race, there really was no specific preparation. On account of all the other types of races I was doing this summer, my only real preparation has been getting out there and doing general training and racing. If you surveyed the 1300 athletes that took part in this Ironman, I’m pretty sure you’d learn I was the only one who did a 6-day trail running race in the mountains 2 weeks before this race. Most folks would have chosen to ‘taper’ leading up to the race, so that gives you an idea about my prep ;-). My principle goal was to get ‘er done, and have fun doing it. As a friend reminded me, this was an opportunity for me to do something I love all day long. I should be ecstatic, right? Truth is, I was excited, and nervous. I was looking forward to tackling a race of this magnitude and seeing what the fuss is all about. So I went in with a good attitude. Now, what can I say about the venue before I get in to the race specifics? Well, for one, the host site was Deerhurst resort. This is a place that holds a special place in my heart. Not only have I raced in a number of events there, it is also the site of where Deanna and I got together initially, AND where I finally proposed to her! Unfortunately, she was unable to make it with me to this event, but I still got to head down to the water where we got engaged, and felt her presence with me throughout the entire event as a result. It’s a gorgeous setting for a race, and they had things very well laid out for the race looming in the next couple days. Race registration and kit pickup went off without a hitch. I was among the last athlete to actually check in for the event. Many people arrive days in advance, so they checked in the day before. There was a 5pm absolute cut-off, and I only made it on-site around 4pm, thanks to road works on highway 60. After registration, I made my way downtown to watch the IronKids children’s races, and take take part in the full athlete briefing. There was even a beer gardens and food vendors on site downtown. Again, the town definitely rolled out the red carpet for us. Race briefing was entertaining, as they actually acted out the entire race day, including transitions and clothes changes. After that, 4 different bands took to the stage to entertain folks well into the night. However, most athletes sadly didn’t stick around much past the briefing! The Saturday prior to the race was a low-key day. I managed to get out for a 1.5 hour bike and a 45 minute run to make sure everything was working as expected. I had put on brand new tires the night before I left Ottawa, and really wanted to test them. After that, it was just time to relax, and check in all my gear at the race HQ (run and bike stuff, as well as leaving the bike overnight). That evening, I had a lovely meal with my awesome hosts, and crashed as early as I could for the 4am wake-up. Morning came far too early. It was dark and chilly out. I rubbed the sleep from my eyes, had my bagel and bowl of granola, and pured myself into the car to head to the start. The transition zone was hopping with activity. I got my body marked, added my nutrition and drinks to my bike, and headed for the water. The swim was a rolling start as opposed to age groups. That means is works like a running race. You line up next to a sign that reflects the time you think you’ll take to finish the swim, and get in the water with people at your speed. In theory, it means less jostling in the water, and avoids getting kicked and bumped. For the most part, it worked well. I got in the water with the 1:15-1:20 bunch, and set out at a nice steady pace. I had no major expectations based on my challenges breathing on account of my lingering cold. However, when I finally pulled myself out of the primordial soup at the 19th hole to find my land legs, I noted that my actual swim time had been 1:10! Not bad at all. I let the magical wet suit peelers do their job stripping me of my rubber cocoon, then trotted off up the hill to the transition zone within the Deerhurst Resort ballroom. I wasted no time in stripping naked to apply chamois cream before putting on my cycling shorts and jersey. Volunteers were on hand to help us with our gear bags and clean up after us. It was a great help to racers. I did some quick filming, then jogged to the start of the bike, pausing to allow sunscreen appliers do their thing (even if it was overcast). I was simultaneously looking forward to and dreading the 180km course. I knew it was quite hilly and challenging, but I’m pretty good on hills, so hoped I’d eke out a 6 hour ride in spite of the challenges. Unfortunately, I was untested this year at racing 180km on my bike. I’d done Rideau Lakes, which is 180km each day for 2 days, but that is not at race pace, and not part of a 3-phase event like this. My focus had to be on nutrition, hydration, and energy conservation. Running is traditionally my strong suit, so I wanted to make sure I had gas in the tank to pull off a good run later. I felt very smooth and relaxed on the bike. For the most part, I held my position, and in fact seemed to pass a good number of folks on the first loop. I was passed by some as well, in particular the speedy cyclists that are not strong swimmers. My nutrition was quite simple. I avoided all aid station food and stuck to my Fruit2 and Fruit3 bars. I wanted to avoid GI issues all day if I could (and trips to the potties). I’d had a Boost before the start of the bike as well, to kick start my nutrition. I also had a bottle of Hammer Nutrition Perpertuem on the bike. I had mixed a 3-hour bottle, and had another 3-hour bottle ready to be mixed at the special needs area at the 90-100km mark. Everything seemed to be dialed in and working well for me. Even the 2nd loop didn’t seem too bad. I knew where the hills and turns were from the first loop, and where I could push a bit vs. save a little energy. I dare say I was having FUN the whole way, with a smile painted on my face much of the way. I stopped twice for a roadside pee break, both times at about the same place on the loop. The scenery was great, and the slightly overcast skies for most of the bike helped. It only started getting sunny at around my 135km mark. We were now into the afternoon, and I realized this would mean a hotter run, so I tried to ensure I kept well hydrated. I was soon on my last 10km chunk of the course and heading back to Deerhurst. This section has the steepest hill, and while I definitely felt it in my legs, I still felt pretty good overall. Having not really paid too much attention to my time, I was very happy to see my time was just over 6 hours when I finally pulled back into transition. I believe it was 6:04 on the official clock. I should be able to comfortably break 12 hours unless things went really poorly on the run. My original goal had been 12:30, with an internal goal of sub-12. In other words, I was having a good day and getting what I deserved so far. Back into the big hall I went, once again stripping off my lower layer to swap the bike shorts for running shorts. I opted to keep my cycling jersey on, since it fit nicely, and was good at thermal regulation. It also benefited from having pockets to store food and my camera. I decided to stick with my 100% self-fueled race, using only what I brought instead of grabbing food at the aid stations. The reason for this was that I KNEW it wouldn’t bother my stomach. Of course, it meant that when I ran back out to the course, I felt laden like a pack mule! I’d brought way too much food for a 4-5 hour effort. I ended up jettisoning some Mojo bars by the 1st Aid station on the run. The bouncing was just driving me nuts. My only course food was on the hydration front. I had to switch to Gatorade from my usual Nuun, since I had no bottles. I alternated aid stations with water and Gatorade (or both). As I’d soon find out, this might have been a bad idea. For the most part, loop 1 of the run (21.1km) was not too bad. I wasn’t exactly breaking any PBs, but had to remind myself that I’d already swam almost 4k and biked a HARD 180k course. So the pace was obviously lower. Energy-wise though, I was good. Looping around for Lap 2, I had already watched the winners come in, and was blown away by their performances. There are some amazing athletes out there! Running back into Huntsville in the now full heat of the day, I could start feeling the tightness in my legs. I focused on a very even stride, making sure I minimized any extra movements, lest I risk cramping. I also popped a few salt pills, and even Ibuprofen, since my plantar fasciitis was flaring up badly. I knew I’d get through the rest, but knew it’d be a mental struggle combined with actual physical pain. My plan worked well, and with short, even strides, I was on the final road (and 3km) from the finish. Then at 2k out, disaster struck! Both my quads completely spasmed and seized up. I was stopped dead in my tracks, and it was all I could do to not fall. I screamed out in agony alerting all those around me of my pain. I got some sympathetic looks and words from other racers. One fellow even stopped to fish out more salt pills for me to take. Unfortunately, I knew it was too late to really help. I stood there massaging my legs for precious minutes, trying to coax them back to life. I briefly envisioned myself needing to CRAWL 2k to the finish. It wouldn’t have been pretty, but I WOULD have done it. Luckily, I got the legs under control enough that I could start a cautious walk, being very careful not to trigger more cramping. At the aid station a few hundred meters away, I had a cup of chips to get more salt in me, and decided I had to just keep going. When finally back on Deerhursrt drive, I managed a very half-hearted jog-shuffle into the dying sun. Daring to look at my watch, I realized that I was still well on track for sub-12, so I didn’t worry any further about my state. Instead, I took the time for me. I took in my surroundings, marveled at the beauty of the setting sun over the tree tops and the manicured greens of the golf course, and realized just how lucky I am to be able to do the things I love to do, and with the support of the woman I love. Everyone goes through these experiences in a race like Ironman, and crossing the finish line without having had that kind of struggle or adversity truly would be a shame. Speaking of finish lines, it was soon my time to hear my name being called. “Stephan Meyer from Chelsea, YOU ARE AN IRONMAN!”. Yes, they call out every single athlete that crosses the line to recognize their accomplishments. After crossing the line, I let myself loosen up a bit and not worry about legs cramping again. Instead, I focused on getting some food in me, and collected my hat, t-shirt, and medal :-). After chatting with other racers and volunteers at the post-race food area in Deerhurst, I dragged myself back out to the finish area to watch more athletes cross for the next few hours. Wth over 1,300 athletes, there were still plenty of folks out there battling their own demons and physical limits just to hear their name be called! It was humbling and inspirational watching all the people streaming in. The party lasted WELL into the night, as the final cut-off was midnight, 17 hours after the start. For my part, I’d capped off my race at about 11 hours and 45 minutes. Not my fastest time ever, but a time I was very pleased with. Of course, my mind was already turning towards my next challenge, which lay only 3 short weeks away, when I’d be taking part in Ultra Trail Harricana and trail running a continuous 125km in the mountains of the Charlevoix Region. How the heck will I pull that off? Well, I’m sure I’ll be carrying LOTS of salt pills this time to hopefully avoid cramping. In addition to that race, I had a trip to Las Vegas for a full week in the middle, which is where I’m writing this up from! The next morning, there was an awards ceremony to recognize all the overall and age category winners, as well as to hand out the coveted slots to the Ironman World Championships in Kona in 2016. We had a bit of breakfast along with that. After the awards wrapped up around 11am, it was time for everyone to make their way back to their respective homes and training grounds, to reflect on their experiences. Personally, I was just looking forward to stuffing my face with lots of junk food for the next week! 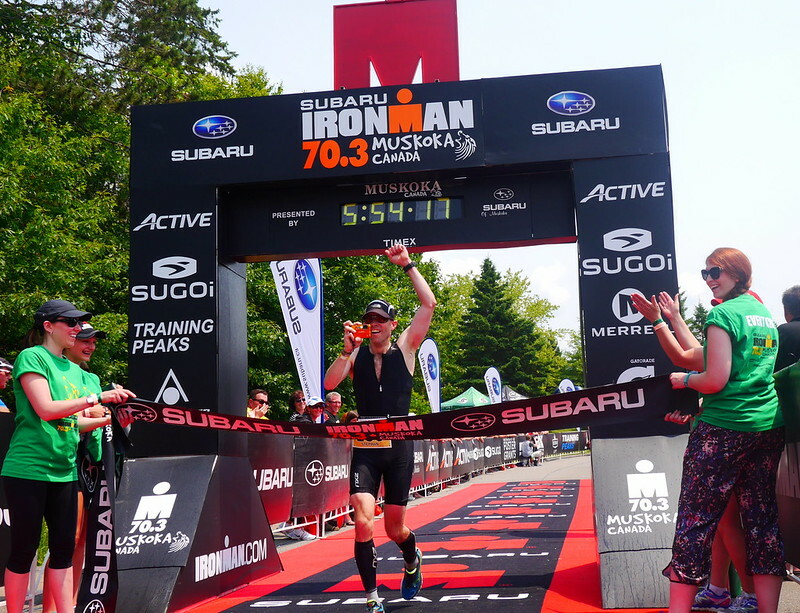 So there you have it, my tale of Ironman Muskoka. As you may have guessed, I lugged many cameras along with me, and as a result, I have a video to show for is (actually, 2!). The first was embedded up top, and below is the final, race day video. Enjoy both, and here’s hoping everyone is still getting outside and making the most of the tale end of our good weather! Greetings race fans. Fancy title, isn’t it? I’m sure some of you are wondering just what the heck I’m talking about. Well, it’s pretty simple really. On the periodic table, Iron (Fe) has an atomic number of 26. Aluminum (Al) has an atomic number of 13, or in other words, half that of iron. Have you put it together yet? 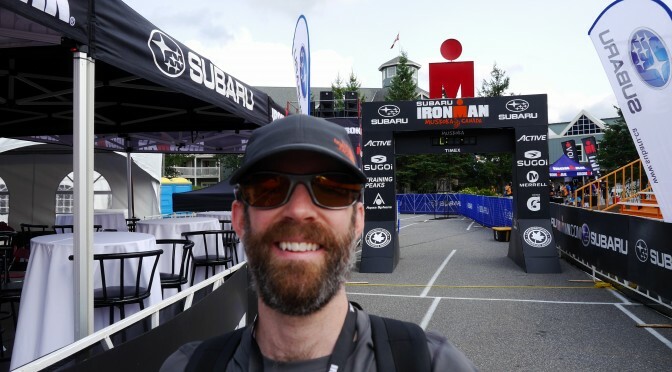 Yup, this race report will be about my recent experience in Huntsville taking part in the Ironman 70.3 event there (a half-Ironman). Of course, this isn’t my first 1/2, or even full Iron-distance tri, but it was my first crack at an ‘official’ Ironman-branded event. It was also one of two that I will do this year, since in a few weeks, I’ll be tackling the full Ironman event at the same venue! Read on for more pictures, details and a video of my race experience in a place that has a special place in my heart! For any of you that are unfamiliar with the basics of a triathlon, or indeed a half-Ironman, let me break it down to you. Swim. Bike. Run. In that order, in different lengths depending on the event. Always continuous and on a marked course. For a half Ironman, it is typically a 1.9km swim, followed by a 90km bike, capped off with a 21.1km run. Between each leg, you visit your transition zone where you change, grab any food and/or equipment you need, and make your way to the next section. There is no external help, and on the bike, you can not draft off people around you. Each competitor must complete the race using their own power only. For my album of pictures click the left and right arrows on the image below, and you’ll see all the pics I have of the event. So, why Muskoka / Huntsville? Well, for starters I love the area. It’s very nature-oriented with great lakes and scenery. Secondly, it is where I got together with the love of my life, and eventually even proposed to her there. 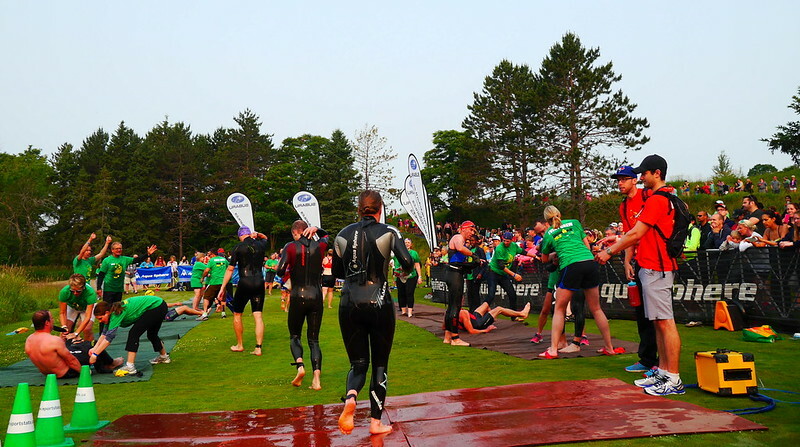 The host venue, Deerhurst, is where we got engaged, and in fact, the location of the swim start of the race is precisely WHERE I genuflected and put the ring on her finger! Also, we have some friends in the area that are gracious enough to host us on occasion when we visit, making it a nearly perfect getaway. 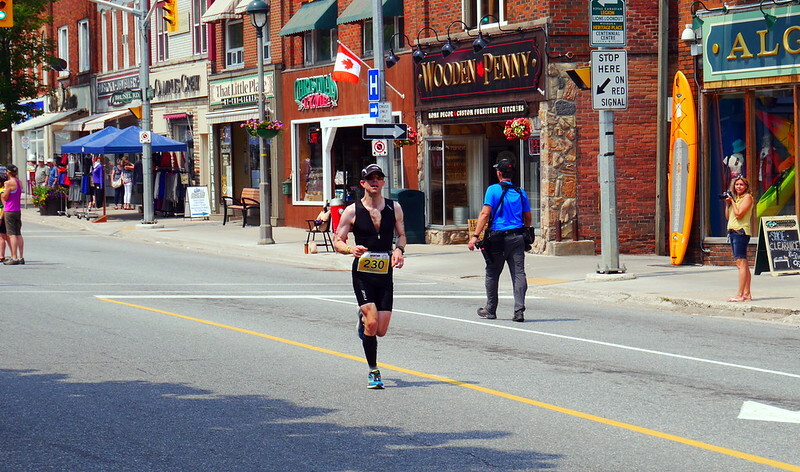 Also, when I decided to embark on my first ‘official’ Ironman, I realized it would be the first time they hosted one in Muskoka, so I figured I’d tackle the inaugural event, and racing in the Ironman 70.3 event in advance of that would give me a good sense of the course. 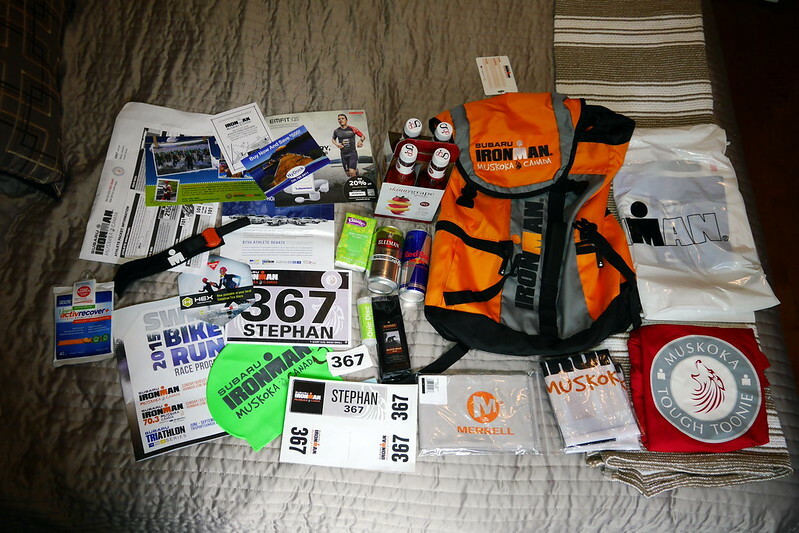 Ironman-branded events are known for their efficiency, great support, and organization. They feature lots of onsite information, organized logistics for things like parking and moving around the area. This was my first experience with the ‘Ironman machine’, and overall, I was reasonably impressed. Admittedly, after doing hundreds of events, I’ve seen the entire spectrum, and while I wouldn’t say it was the best I’ve ever seen, it was definitely better than average, definitely in terms of the sheer number of people helping out making sure everything was smoothly executed. Despite there being nearly 1,400 athletes, I got through the whole sign in process very quickly, walking out with my race number, timing chip and swag bag in under 10 minutes (including filling in waivers!). The key? They put people where they were needed and these volunteers knew exactly what to do in their posts! In addition to the registration area onsite, there was a modest race expo with a number of vendors showing off their wares, a bike tune-up / tech area, and of course the ‘official’ Ironman merchandise store. I was blown away by just how much merch the IM machine churns out, and equally surprised at the number of people stocking up, kitting out their whole family in commemorative gear. Certainly looks lucrative. In case there was any doubt, I bought nothing. The experience, coupled with the finishers hat, medal and t-shirt were enough for me. After cruising the expo / store area, I also had the opportunity to listen to an Ironman legend give a talk on how to build from your Ironman 70.3 to the Ironman event just 8 weeks later. So who was the legend? None other than Lisa Bentley, an 11x IM Champ! She not only knows a thing or two about Ironman racing, but is a local hero, and one of the driving forces that got this race going in the Muskoka region. I listened to her talk, and took a few mental notes on how I might apply her tips to my own situation (which is a bit complicated with things like a 6-day trail running race in Colorado BETWEEN the two events …). Once that was over, it was time for an all-athletes briefing to let us know how things would unfold the next day, including details on food on course, things to watch for, time cutoffs, etc. They made plenty of time for any questions, to make sure that all the athletes left the briefing comfortable that they knew what to expect. With that out of the way, it was time for a nice supper with friends in Huntsville, sort my transition bag one final time, and head off to slumber land before the 4:30am wake up, to allow time for eating, drinking, digesting, and setting up my final T-zone before heading to the waters’ edge for the swim start. The weather was gorgeous! Temperatures in the morning were ideal for getting in the water, and starting to exert yourself but not overheating. For those curious, the water was definitely cold enough that wetsuits were worn by pretty much everyone. For my swim, I didn’t really know how I’d do, but hoped to swim similar in speed to my last events. I can definitely say that training in my pool using the Swim Tether that I bought has been very beneficial. Had it not been for that, I likely would not have gotten much swimming done at all! I waded into the water, with my age 40-45 red-capped competitors for the start. As it turns out, my age category boasted the biggest field and the greatest depth of talent. Say good by to ANY podium hopes on this one! I eased into a smooth pace, deciding to relax and enjoy the day, and not get caught up in the start pandemonium that can catch racers off guard at the start. Before long, I was swimming along smoothly pretty much undisturbed, near what I can only figure was about the top 25% of my group. The water was clear and refreshing, and swimming towards the rising sun was pretty special. It put me in a great mental state before finishing the swim loop and moving towards the next leg of the race. Although the water exit was only wide enough for 2-4 racers at a time, there was no bunch up at all. Volunteers were on hand to help you climb up the exit stairs in case you didn’t have your land legs. Then, after crossing an arch and the timing mats, there were teams of strippers (wetsuit strippers that is!) to help us out. You just had to undo your zipper, flop to the ground, and they would peel you like a banana, toss your wetsuit back to you and cheer you on as you trotted up the steep, long climb back to transition. Luckily, with the adrenaline, I hardly noticed the 300+m uphill slog, and found myself face to face with my bike in good time. I wasted little time putting on socks, shoes, helmet and running out to the mount / dismount line. What can I tell you about the bike? Well, for starters, although I had mentioned that the bike leg of a half Ironman is typically 90km, they made this one 94km. Just for fun 🙂 Or maybe because that was the only logical loop roughly that length in the area… At any rate, it was a doozy. Plenty of rolling hills the entire way. There were virtually no flat sections to speak of. On the plus side, it kept things interesting, but the flipside to that is that it was pretty taxing after a while. Luckily, pretty much all my training is on hills and non-flat roads in Gatineau Park, so I’d say I was well prepared mentally for this type of course. As tempting as it would be to ride along with people and chat, such behaviour is actually an actionable offense. Penalties can abound if you are either blocking, drafting, or riding beside someone. Too bad, as I think it might make triathletes a more friendly bunch if they could just talk to each other on the bike 🙂 I saw bikes of all sorts out there on the course, from super top end tri machines to Canadian Tire specials! As I already knew though, the bike is secondary to the engine powering it. Granted, if you are at the pointy end of the stick, I’m sure the more aero bikes can give you those precious minutes, but in my level, I’m happy on my steed, and focus on form and technique. For my efforts, I’d say I was rewarded. I managed to complete the whole 94km rolling course in 3:04, which is over 30km/hr, and a speed I was VERY happy with. I had planned on averaging something closer to 28km/hr, so I had some ‘found time’ to work with now. The roads had been quite good, and the aid stations well staffed and well placed. Anytime I thought I could benefit from a fresh bottle or some food, it seemed I hit an aid station (and there were only 3 on course). I had brought my own nutrition, but good to know there was food available had I needed it. I took advantage of the Gatorade out there to supplement my Nuun, and make sure I was well hydrated, as the weather was getting warmer as the day progressed, and overheating on the run is no fun (as I have experienced many times…). Rolling back into transition, I had mentally worked out my plan, so it was another quick transition for me. Change of shoes, grab some Fruit2 snacks, trade the helmet for a cap, and off I went. I was hoping to crush the run, since in my mind it is my strong suit. I was only partially right. Compared to many other racers, I was definitely a faster runner in my age category, but the overall time was not all that impressive, but I guess given we had already swam 1.9k and cycled a tough 94km course, that is to be expected. I don’t know why, but I always imagine I should be able to bang out a 1h30min half marathon each time. I have to learn to adjust expectations. 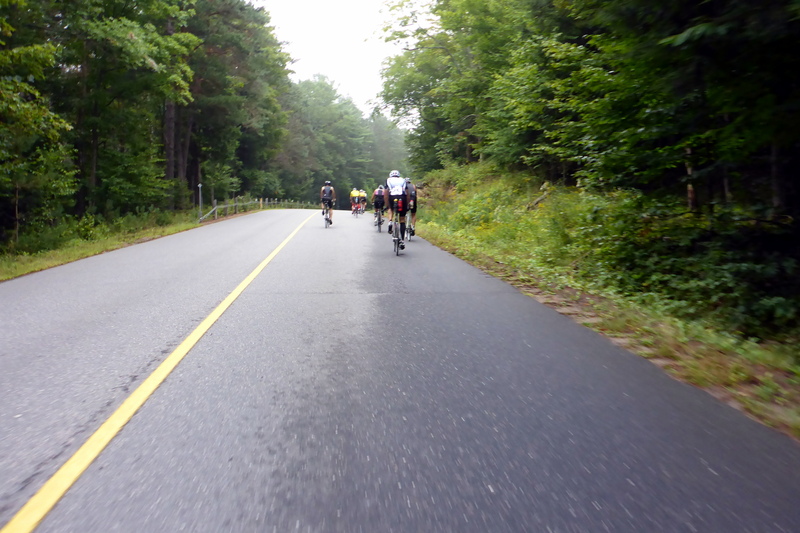 I must say, I definitely did start out quite strong, passing a lot of people on my way out of Deerhurst and into the hills that feature prominently at the start as we made our way to Highway 60. I felt light on my feet, and very happy given my strong bike time. Kilometer after kilometer I plodded on, until I was in the town of Huntsville and got to see the lovely Deanna for the first time since my swim exit. She had been on course taking photos and video while I was racing, and had staked out a nice spot in town. I ran over and gave her an ‘air kiss’ before trotting off towards the turnaround a couple kilometers further. That’s when my GI issues kicked in a bit. Until then, I’d stopped 2 times (once on bike, once just after the run transition) to relieve myself, but now I was feeling some definite churning below that I know too well from other races. I had to make a slightly longer stop in a pink porta-pottie before I could head back out. After that, while I didn’t have to stop for a pottie again, I did get some nasty stomach cramps, first on my left side, then on my right. I sucked my energy out. I’m pretty good at managing pain, but these were cramps that I literally COULDN’T run while having them. At one point, I was limping as fast as I could while squeezing my side as hard as I could to stop the pain. It was far from pleasant, and I was wracking my brain trying to understand what caused it. I hadn’t strayed too far off my normal nutrition plan, so it might have just been bad luck this time. At any rate, the next 5 or so kilometers were ‘painfully’ slow. My reward for suffering through the rest of the run was a time of 1:48:07 on the half marathon run. Still a very decent time in my age group, but I KNOW I could have shaved about 5 minutes off that with no GI / cramping issues. Regardless, I didn’t let that hamper my spirits. If I had been out to win, it might have mattered, but my goals are pushing myself, and enjoying the course, both of which I achieved. As a result, when I crossed the line with a final time of 5:34:18, I couldn’t complain, and had a huge smile on my face. Certainly better than the 6 hour prediction I had made due to the terrain. The other great thing (as always) after crossing the line was the fact that Deanna was there to congratulate me and tell me she was proud of me. At times after races, I can be self-deprecating if I’m not happy how it went, but without fail, she tells me I’m awesome, and it just makes you feel good to know someone thinks you rock! After the obligatory finish-line hang out, enjoying cold water, even colder Erdinger alcohol-free beer (check out where it stands in rankings here), and watching other racers finish, it was back to the expo hall for a post-race meal and the awards. The food was quite good, which wasn’t that surprising given that we were being hosted at a resort. The awards were typical, in that we had to go through all the age groups, and it was just a big room of people waiting to learn whether or not they had won slots into the Ironman 70.3 World Champs. There are a number of slots up for grabs in most age categories, and if you get one, you have to sign-up and pay ON THE SPOT for the privilege of racing in Austria. I was glad I didn’t have to stick around for all that! Probably the funnest part was the fact that the top male and female finishers each won gigantic mugs of the Erdinger alcohol free beer as part of their prizing, which just looked goofy and awesome! All in all, I was definitley impressed with the event, and would recommend it to any looking to take on an Ironman 70.3 event in a beautiful venue. If there is one other thing worth mentioning it is the fact that the entire community is behind this event. 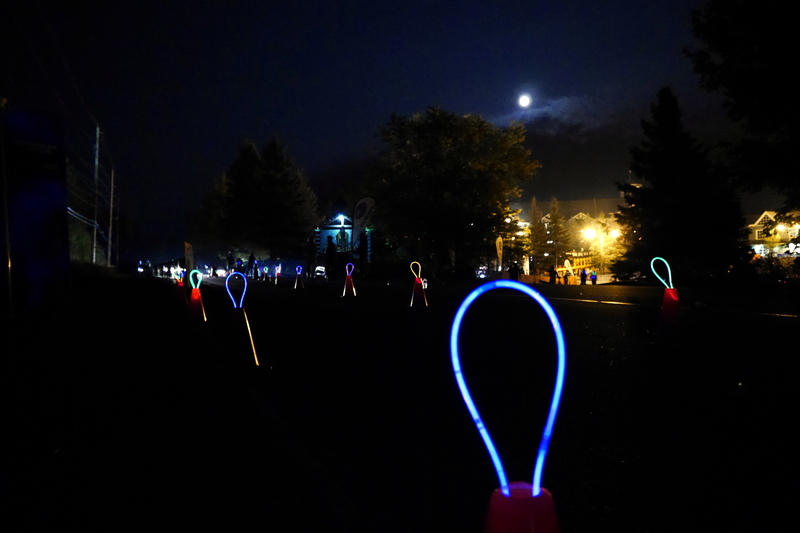 Most volunteers were residents, many of them both volunteering and taking part on things like relay teams, etc. There is obviously a huge benefit for local businesses and the community, and they have recognized and embraced this. In spite of roads being semi-opened to traffic all along the route, I never once witnessed any bad behaviour by angry locals, which is more than I can say for other races I’ve done. If you’ve gotten all the way here, but don’t quite think you got the full sense of the race, then you’re in luck, since I was also filming the event. Below is my final video showing various aspects of the entire race, and giving an idea of the scenery. Watch and enjoy, then keep your eyes peeled on this site for future stories from my upcoming race in Colorado! 6 days of trail running Nirvana! Cheers! The vision in my mind was clear. The start is called, and off I go, paddling hard and efficiently at the front of the race pack. I nail all my navigation challenges, bag all the CPs, and have quick transitions, to cross the finish line first, with no one even near me. Well, as you know, vision is often different from reality, particularly in the adventure racing world. So goes the backdrop for my start to the 2013 ‘Summer’ race season. I found myself once again in Huntsville, at Deerhurst Resort, for what may ultimately be the final Frontier Adventure Challenge. This was slated to be a 5-8 hour adventure race featuring all the fun of a classic adventure race in a manageable format. I was covering the event for Get Out There Magazine, and the lovely Deanna also joined me as a volunteer / race photographer. Good thing she had a brand new camera to try out! As a result, I’ve got both a video to share, as well as a whole folder of pictures that Deanna took. Now read on! Leading up to the race, things were pretty mysterious from the race organization. 3 weeks out from the event, we hadn’t even been told where it would actually be held. We were assured it was in the ‘Huntsville / Lake of Bays’ region, but beyond that, no host venue announced! Add to that the fact that Huntsville was actually under a state of emergency due to flooding and you can understand why we were somewhat dubious as to how the race might actually go. Would it be a paddling race only? Luckily, in the final week and a half, we were given the venue, as well as an idea of what were in store for. They apparently had to tweak the course, but with reducing water levels, we’d be good to go. That was comforting. To save some pennies, Deanna and I booked a cheap (but excellent!) hotel in Huntsville, aptly named the Huntsville Inn. Upon arriving and them seeing all my gear, they even upgraded us to a bigger room for the same price ($58 a night!). Back at the hotel, I got all my hydration, nutrition, gear, and clothing sorted into the right transition bags, and made it to bed shortly after 11pm. Not bad at all. As I lay there awake for a while, I visualized all my transitions and how to be most efficient, as well as deciding both my videography plan (trying to not slow down too much), as well as my game plan for decision making. What I mean by that is what I’d do depending on whether I was leading or trailing in terms of changing clothes / eating / filming. It’s a delicate balance to get right, and warrants planning. Next I knew, it was 6am and time to get moving! 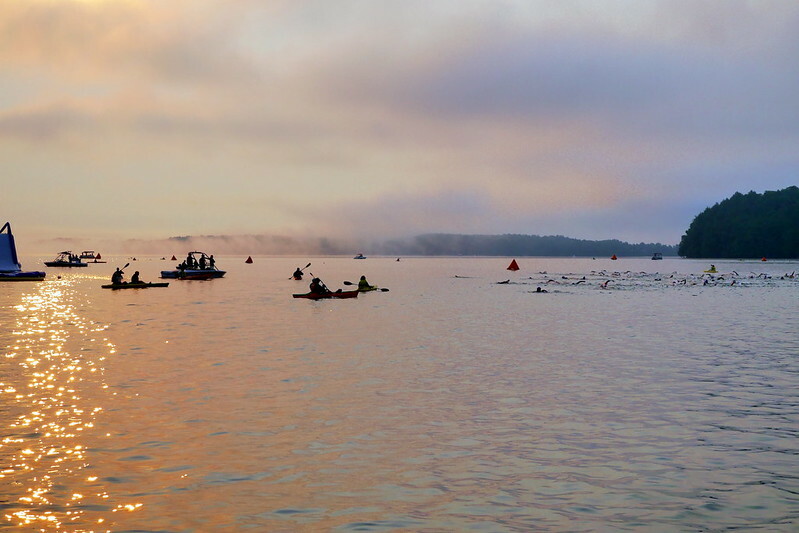 Under perfectly clear skies and calm conditions, the race got underway on the water at Deerhurst Resort. Total distance paddled was about 11km. Our route was pretty much due west from Deerhurst through the little canal leading to Fairy Lake. From there, we made our way to a pull-out at the base of Lion’s Head Lookout, where we scrambled up for grab CP1. From there, we wound our way down to a dam near Brunel Road, where we pulled out at TA1/CP2. Personally, I had a pretty good paddle. I was in about 8th or 9th at CP1, but made up a few spots on the steep climb, hitting the water in 5th place. Lost one more spot and finished off in 6th place. Luckily, the race is seldom decided on an opening leg, and in the paddle, there isn’t a whole lot of spreading out. I was only 6 minutes behind the leader at that point. I had a pretty speedy transition (in spite of some quick camera changes), and left the CP in high spirits (and possibly in 4th place. Lucky for me, the bike section played to some of strengths. Namely, my light weight, and the fact that I was on a 29er :-). Total distance was about 20km. The first 2.5k was on paved road, so it was a good distance to get the legs working. After that, it was time to turn into the dirt roads, then eventually into the real ‘trails’, which as usual were a delightful mix of mud, sand, and swamp along snowmobile trails. The total distance traversed in this stuff was only 7.5k or so, but seemed a lot longer! The best description I can give for some of that mud is that it was the consistency of pudding. Patience and ‘finesse’ was the only thing that could get you through. Lucky for me, I’ve learned both of those over years of this kind of racing, and managed to get through in a pretty timely manner. During the bike, there was a decision point about whether or not to tackle the advanced section, but it really wasn’t a big decision. I was at the front end of the race, so skipping that CP would have been silly. In the bike section, I managed to bounce between 3rd and 4th the whole way, and avoided any major snafus. Yes, I went on the wrong trail a couple times (it’s always a maze out there! ), but always corrected myself within 100m of the error, which helps big time. I credit this to my judicious use of both my compass, as well as having carefully measured distances to features using my digital map measuring tool. My only major screw up was near the end once back on the roads. I zigged when I should have zagged, and instantly dropped 2 spots :-(. Due to that, my check-in at CP5/TA2 (back at Deerhurst) was at pretty much the same time as 3 teams, so it was top 5. Ahh, the trek. The is normally where I have things dialed in the best. I love a pure bushwhack where I need to rely on my compass only. The problem with this trek section was that it was directly across from the resort, on a network of ‘marked’ trails. We even got a ‘toy’ map of those trails (no scale, no indication of N, etc.) to help us. The trouble is, when you have trails, it’s tempting to take them rather than just shoot a bearing. A perfect running of this section would have been about 4km, but with some ‘errors’ and hunting around, I probably had closer to 5km of trekking under my belt. Luckily, I wasn’t the only one with errors, and the standings changed a big in that little section. I won’t bother detailing all my errors, but my first one was a stupid overshoot because I thought the scale on the little map was a little smaller. Quickly fixed that and went on my way. My big mess-up was trying to find CP9: “On a ridge near a steep embankment”. Yeah, well, the ridge stretched a long way, so actually finding it first try didn’t happen and required some hunting and triangulation. I assumed this would be my undoing, but kept pushing hard. From this one, we hit the ‘advanced’ section, consisting of 3 checkpoints. Luckily, that meant they were pure orienteering, with no trails. Leaving nothing to chance, I took clear bearings, and followed straight lines, no matter how stupid (i.e. scaling down 20+ft cliffs). It paid off however, as I hit all 3 dead on, and had someone in my sights heading back up a ski hill. Little did I know it was Chad Spence, the fellow in 1st overall! Rather than engage in a foot race, I opted to be careful about grabbing my final CP by re-setting myself by using a cell tower as a landmark. He instead opted to go directly to where he thought the trail was. He made the right call, and as a result, I finally emerged from the woods running to the line less than 2 minutes behind him, surprised to learn I was 2nd overall! However, the drama wasn’t quite over. While I had retained my electronic timing punch the whole race, I had lost my paper CP passport in the bike section. As this is a mandatory piece of gear, I was assessed a 10 minute penalty. I knew 3rd place wasn’t far behind. However, he had screwed up the final advanced CP by climbing to the TOP of a ski hill while it was at the bottom. I had seen him at the top and told him it was at the bottom. The question was how fast could he descend the hill, punch the CP, climb back up and complete the race? Lucky for me, it was nearly 13 minutes, which meant I was now officially 2nd overall! What a great start to my race season! We all celebrated at the finish and congratulated each other on a great race. So, in the end, two teams finished the course in under 4 hours, all in, and I was one of them. Looks like Brad’s prediction was bang on. What I hadn’t counted on was that *I* would be one of those “top teams”. It definitely felt good. The remainder of the afternoon was spent enjoying the warm sun, cleaning up the bike, sorting the gear, and showering and changing. I even went back on the course (with beer in hand!) with a youth team of 3 girls to help them finish the race and give tips on how to find a few of the CPs. Gotta encourage the new racers, otherwise this sport will NOT survive! Later on, there was the post-race buffet, and more drinks with racers and the organizers. It was a great night, and a great weekend all in all. This race (and location) has a soft spot in my heart now of course, as it is where Deanna and I got together, and also where I proposed to her. It will be sad if this is the last time a race is held there. Here’s hoping someone takes over the reigns of the organization of this event! With this race out of the way, the next one is a mere week away from now as you read this. Next up: the Raid Pulse spring race (there’s still time to sign up!). I’ll be racing that one with James Galipeau, a top racer from the region that does a lot of International races. Should be fun. Stay tuned for that report, and in the meantime, enjoy the video of this race! They say everyone has a doppelganger somewhere in the world. Well, apparently, I may have inadvertently crossed paths with my ‘sporting’ doppelganger at the recent inaugural Muskoka Grind Off-Road Tri. You see, I finished this race in 4th place in my category, a mere 1m14s off the podium. Okay, 1:14 isn’t that close in a 2.5hr race, right? Well, it get’s interesting event by event. For the swim, this fellow was a mere 3 seconds faster. The bike? He was only 16 seconds faster. And the run? Well, I took that one by 16 seconds! So in reality, our moving time was only 3 seconds different!! However, where I lost time was in transition, and with good reason. I had to get cameras mounted and ready for the bike and run, since I was on-site covering the event for Get Out There Magazine. As a result, I once again have a nice race video and some pictures to share with you all. Read on for the whole story about this well-run race at the Limberlost Forest and Wildlife Reserve. Regardless of how the event turned out, I must say that I have once again found a gem of a place in Ontario. The Limberlost Reserve is a really nice place for trail running, hiking, paddling, and biking. While it is privately owned, and there are active forestry operations there, it is also a reserve with over 70km of trails that are free to use by anyone (although donations are appreciated). This place is just east of Huntsville on the 60, and in all my trips in that area, this is the first time I’ve set foot there. Apparently they also host a great trail running ultra that I may have to look into! The idea of doing an off-road tri was right up my alley. 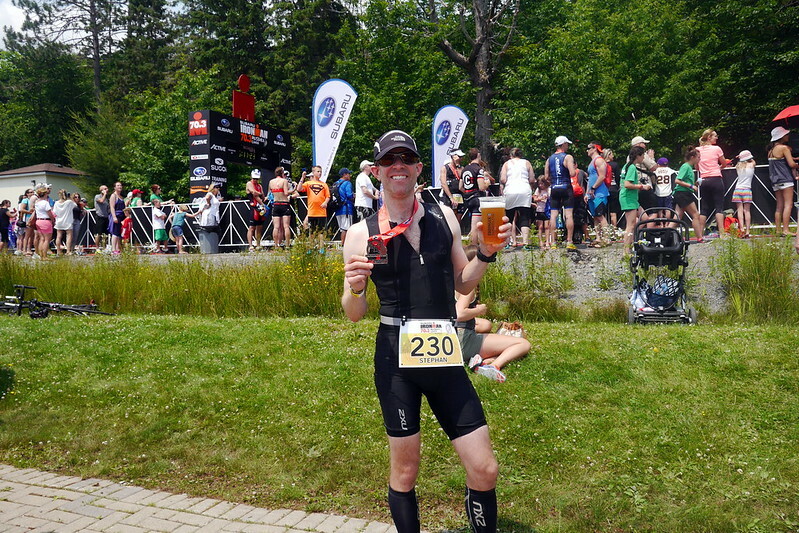 It combines two of my favourite sports, triathlons, and being off the pavement 🙂 The last time I took part in one was in Calabogie way back in 2006 (read my report here). I’ve done a lot more racing since then, but apparently, I’m still a 4th-place type finisher :-). At any rate, for this race, Deanna and I opted to camp once again in Calabogie at Jim’s place Friday night before and Sunday night. That left a drive from Calabogie to Huntsville on Saturday, and staying with family friends in the area, which was fortuitous, as while Friday and Sunday nights had good weather, it poured buckets in Huntsville on Saturday! Now on to the race. We got up on Sunday morning with trepidation. Forecast had called for 100% chance of showers this morning. We had pre-rode the bike course Saturday in the blazing sun, and while an amazingly fun course, it would definitely be ratcheted up in difficulty level with heavy rain. Luckily, it was NOT raining, merely overcast, and the forecast had actually dropped down to like 20-30% chance of rain. Lightening was also a risk, which could really mess up the plans by the RD. He couldn’t have people in the water if there was lightening. Again, so far so good, and at the race site, things looked relatively calm. I got my gear together in my transition area, and headed off to get my body marking done. Deanna offered to help by taking some video for me while I was out for the swim, and I also planned to film the bike course with my GoPro on the handlebars, and carry another camera with me on the run. We were slated for an 8am start, and that went off without a hitch. The swim course was a double loop. 200m out, 100m across, 200m back, around a buoy in knee-high water, then out for a 2nd loop. What can I say? It was uneventful. I gave it a good push and came out of the 1km course in under 18 minutes, good enough for 13th. Happy with that, I trotted off to transition to get out on the bike. I took a few minutes in transition fiddling with the camera on my bike, as well as getting all my gear on and smiling for a quick photo before heading to the mount line. As a result of pre-riding the course the day before (2 full loops), I knew what I’d be up against. The trails are actually designed for hiking, so there are no flowy berms to follow on turns in the woods. Often, there were sharp turns with rocks lurking just out of sight. Being aware of some of those would definitely prove valuable to me, as with the overnight rain, things were much slicker than the day before. The trail was immensely enjoyable, and I found a pretty good groove on the pedals. Of course, I know I’m not a world-class mountain biker, so it didn’t take long for Mike Abraham to catch and pass me on lap 1. We were having another of our unspoken battles for supremacy on a racecourse :-). My only hope would lie on the run. In addition to the sharp turns, there was actually a mandatory dismount section where there were rock steps taking participants down a steep section. I had ridden it the day before, but can confirm they made the right call to make this a walk section. I suspect several people would have gone down and possibly gotten injured otherwise. I stayed focused the entire 2 laps, and don’t think I lost too much time on lap 2, as I kept a steady output. I managed to pass a few people, and was only passed myself 2-3 times. Heading back to the transition, I had the 17th fastest bike split, but looking at the numbers, I had unfortunately lost 9 minutes to Mike, who is a very strong mountain bike. That was a huge deficit to try and overcome in an 8km run! But at the time I had no idea where I stood. Off to the run! Okay, with the bike out of the way, it was time to tackle my strong suit, the run. I tried a quick transition, and was just running out of the t-zone when I realized I’d forgotten my hydration belt. 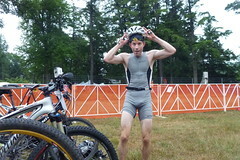 Given the heat and terrain challenges, I had opted to wear a hydration belt. In retrospect, I regret the choice. Not only did I lost time doubling back to grab it, but the damn thing was bouncing around a fair bit and kept rotating on my torso. Although it meant I could just run by the aid stations, I think it was more trouble than it was worth and led to some lost time. But I digress. The run consisted of a single scenic 8.6km loop around a lake. The trail was properly challenging in spots, with lots of roots and rocks to navigate. Although it was relatively flat overall, there was one moderate climb at about the mid-point. I focused on a steady, near-redline pace that I hoped would catch me up to Mike (and all others ahead of me). My efforts were rewarded in the form of passing 6 people on this run, but never even catching sight of the mighty Mike. I also got an additional reward towards the end of the loop in the form of a severe left hamstring cramp. I had just passed a fellow, but then had to reduce speed to a limp (as well as totally stop to massage it out) for a good 200m. Dang! Luckily, I kept this competitor behind me, and managed a little finishing kick when he tried to pass me coming into the finishing 100m of the course. I didn’t like doing it, but I pushed hard to get to the line and keep my spot. Of course, then I found out he was in the duathlon, and hence a different race! Ha ha ha. Either way, the push felt good, and I finished the race quite exhausted and knowing I had put pretty much my all into this. I had the 5th fastest run split, and had put 4.5 minutes on Mike, but in the end, that gave him victory by 4 minutes. Well played Mike! I knew the race would be won or lost on the bike course, by far the longest and hardest part of the race. Overall though, I was very happy with my performance. All in all, a great day at the office for me. The race was excellent through to the end, where an amazing post-race spread of food was on offer for racers, all catered by local businesses. That included a tasty post-race beer from Muskoka Brewery. Yum! As we packed up and headed out, the rain finally made an appearance. So basically, the entire event had a bubble of good weather for us. Nice. I’d be back in the area in 2 weeks for a 30 hour adventure race, and till then, just training, and volunteering at another race. The summer race season is winding down kids, but stay tuned for a few more reports from cool events! Do you see what I just did there with the title? Pretty clever, hunh? I can guarantee you all that this blog post will be unlike most of the ones that I write out for you all. In fact, I’m pretty sure it’ll be the only time you ever read about such an occasion from me 🙂 The genesis of the plans for this momentous occasion happened some time ago. In fact, the moment was over three months in the making! It’s a story that makes me very happy, and I’d like to take a few paragraphs to write about how it all happened. Obviously, you know the outcome of it all, but it’s still fun to go back in time and see how it all came about. Please read on if you’re a romantic and want to hear the tale. 2010 was a pretty major year in my life. Early in the year, I went through some pretty big changes. One thing that didn’t change was my passion for racing and being in the great outdoors. To those ends, I’d signed up for the Frontier Adventure Challenge, which was to be held at Deerhurst Resort near Huntsville. I had no room booked, and no team. Just going solo for the fun of it. I can honestly say there is no way I could have predicted what was in store. There was volunteer at that race. Her name? Deanna. I’d met her in 2006 at another race, and we’d gotten along well every time we’d hung out at races. She, along with her uncle and father, often helped out at these events. However, in the past, I’d obviously never made any passes or hit on her, just joked, talked, and got along. This time however, I thought I’d perhaps be a little more forward with her. We were both single, so why not? What’s the harm? That night, after the awards, we both attended the same post-race party and flirted with each other and went for a nice evening stroll that stretched late into the night. Having nowhere to sleep, I walked Deanna back to her room, then promptly returned to my car for an uncomfortable, yet happy sleep in the passenger seat with all my stinky gear (all this alluded to in the original blog post from that race). The next day, we spoke a little bit, and then I had to leave. I had just moved into my new house, and was still setting things up. Deanna was also helping out at the high-school race that day, so she was busy. However, some spark had started the previous night, and I was rather intrigued. So, on the way home, while stopped at Dixie Lee in Barry’s Bay, I tentatively texted her my email address and other info. I also innocently asked if she might like to visit me for a weekend (she lived in Toronto). To my surprise, she said yes the next day. Later I learned that her process was basically that she couldn’t find a good enough reason to say no, hence saying yes! That first weekend almost didn’t happen, as she remembered some other plans that had been made, but a last-minute shuffling, and she was on a train to Ottawa. I was very nervous at the prospect, and spent most of the week trying to get the house in some sort of shape to accept guests that I’d like to make a favourable impression on. Painting, wiring, furniture, etc. All had to be done. All the while training, and chatting lots with Deanna via email and texts. During the visit, we started to get to know each other a lot better, and I did my best to cook nice meals and show her great things to keep her interest. Neither of us truly knew where it would go, but we had a lot of fun just being around each other. I believe the quote from her that weekend which will forever remain in my head is “If you treat me this well all the time, you’ll never get rid of me.” We laughed about that, but who would have guessed how prophetic it would prove to be! Over the course of the next few months the fun and happiness only grew greater every time we saw each other. When we were apart, we kept in constant contact through emails, instant messages, Skype video calls, phone calls, etc. etc. It didn’t take long for both of us to hate the time apart, and when a weekend would pass where we weren’t together, something was clearly missing. In fact, to try and make things work even better, I negotiated an arrangement at work whereby I could work from the Toronto office for 1 week per month starting in the fall. Of course, even that quickly became not enough. We knew we were bound to be together and that we both wanted to accelerate that process. As such, Deanna took the big plunge and started looking for work in Ottawa. Although there was some discussion, it was agreed that this was the best option, as our lifestyle was more suited to Ottawa than Toronto on the whole. I couldn’t overlook the fact that she was making a large change for me, and could only hope that this was the right decision! As all of you will know and can likely attest, this was absolutely the right choice, and the best thing to happen in both of our lives. We are both happy beyond words, and to this day, are pained whenever we need to be apart for any length of time. Quite obviously to me, it was time to start thinking about next steps. Occasionally, perhaps after a drink or two, I’d invariably joke with Deanna and say ‘marry me’. She would usually say yes, but pointed out that a ring was needed. Also, her nanny was constantly teasing us and asking if we were engaged yet. Something had to be done. January 2012. Dates are announced for upcoming adventure races, and lo and behold, the Frontier Adventure Challenge was once again on the first weekend of May. Not only that, but it would be held at Deerhurst resort. It was too perfect. 2 years to the day, in the exact same location, we’d be together again, with me racing solo, and Deanna volunteering. It was now my mission to plan the perfect proposal for us. Over the next few months, I turned my attention to acquiring the perfect engagement ring, which ended up being custom made for her. I also sought her father’s blessing on the matter, and spoke to her uncle Bill about perhaps helping on the day by taking pictures. Eventually, this also turned into having her sister and mom at the same place as well, and Deanna’s nanny even coming down the next day for brunch. All the seeds were sown, and it was now just a matter of timing. I’d only gotten the final ring back a couple days earlier, and had to sneak around numerous times to make sure Deanna didn’t know I had a ring for her. I was now at the mercy of weather and the race. I didn’t want to propose outside in the pouring rain, or have a really bad race where people were grumpy. Luckily, everything worked out perfectly. I had a great race, then proceeded to shower and clean up, and tuck the ring box in my pocket. On the pretext of snapping a few photos in the setting sun near the water where we’d first gotten to know each other two years ago, I convinced her to join me. I set the camera on a tripod, and took a couple photos. 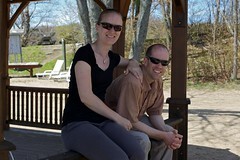 I then hit ‘record’ on the camera, got down on one knee, and popped the question. I got exactly the reaction I’d hoped for, and had totally taken her by surprise. She was so excited to show the ring to her parents. I then asked her “Why do you think they’re here?”. It then dawned on her that this had been orchestrated some time ago. The rest of the weekend it was great to see how giddy and excited Deanna was. We had Sunday brunch with several family members before finally heading home, now as an engaged couple! It was one of the best decisions I’ve made in my life. However, I maintain that the best decision is the one where I decided to text her from Dixie Lee in Barry’s Bay that day two years ago. I could have just let it go and maybe ran into her again in the future, both following different paths, but on that day, in that moment, something truly amazing began, and I can’t wait to see how the rest of this journey unfolds. Deanna, I Love you, and you have made me the happiest man in the world already! The sun was beating down hard on my neck. My leg muscles were just on the edge of starting to cramp after over 7 hours of hard effort. A team up ahead had paused to debate the merits of taking one route over another at an intersection. With my head down and with determination, I blew past them and pedaled hard to the finish. Keeping a very short lead on them, I crossed the line as 4th solo male, and 6th team overall at the spring Frontier Adventure Challenge in Huntsville. In retrospect, had they made the turn, they would have had 1km shorter to travel, and would have beat me, but seeing me blow by made them change their minds and try to chase me down. I got lucky this time! Of course, dear friends, I’ve just revealed the punchline, the finish of the race. This was the first summer race of the season, and it was a great one. Read on for the full story, video, pictures, and all the good stuff! Some of you may be wondering where I’ve been hiding these past couple months. Have I been eating bon-bons and playing video games and fattening up? Well, not exactly. I’ve enjoyed a couple months race-free, but that just meant I had the time to start tuning up for the summer sports, and get some things done around the house. Early May is a great time to get back into the racing season, and luckily, there are a few classics on the calendar to help with that. 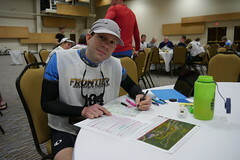 The first weekend was the Frontier Adventure Challenge, a 5-8 hour adventure race that draws racers from Montreal to London and points in between. I was racing solo, and covering the race for Get Out There Magazine through a video review, and hoped to put in a solid effort. As we got closer to race time, the finalized racer list indicated quite a few solo racers with solid record would be coming out. This would be no cakewalk, but I had nothing to lose. I felt great, was happier than ever, and just wanted to race hard. So let’s see how it all played out. The course designer was tackling the race for the third time. His first course was a touch too challenging for many. His 2nd course turned out too easy for the top racers. This time? Nearly perfect! The front runners had to put in a hard effort to complete the whole course and get all the sections including the advanced ones. Beginners and novices had several points in the race with cutoffs which helped ensure most people finished the race around the same time. 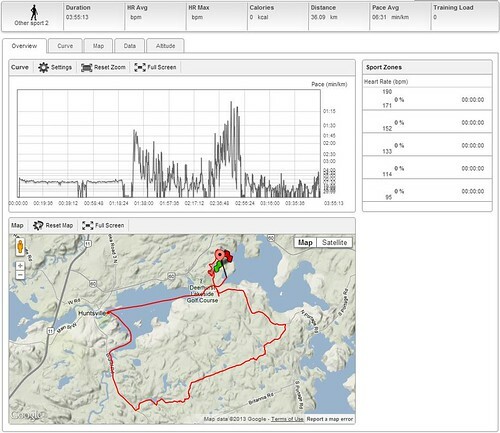 For nearly all racers, that meant over 7 hours of racing in the beautiful wilds of Muskoka. It was spectacular all around. The actual course design looked pretty straightforward. Of course, they all do when you first get maps and plot the points. There were no complicated logistics, as all transitions occurred at the same central spot, and the final half of the race you needed to be self-sufficient, carrying all the food, water, and trek and bike gear required. Race morning was chilly but would get nice. Map prep went smoothly, and there was a big crowd of teams excited to hit the trails. To quickly step through my race, I’ll go over each section and summarize. Section 1 was a bike and trek deal. Hop on bikes at the start, with a lead out on some pavement to spread the teams somewhat, before diving into the ATV and snowmobile trails well known to adventure racers. Recent rains made some of these trails interesting, with nice mud pits and plenty of water. Staying clean and dry, as usual, would be tough. I had a great ride, and hopped off my bike at the far end for the trek section in 3rd place overall. There were 2 checkpoints to grab in the woods, and I made a few errors in there which cost me slots. I also did it all in bike shoes. Back on the bike to head back to the TA with another CP to grab on the way. It should have been easy, and I almost hit it dead on. Unfortunately, I chose to search right instead of left, and wandered too far around a lake, costing me more time. I was rather frustrated. With a little angst, I roared off to the TA for section 2. Section 2 was an out and back paddle along a nice lake. Thankfully winds were pretty low, even though somehow it managed to be a headwind BOTH WAYS! Never understood that, but have seen it on more than one occasion when racing. Murphy’s Law and all that I guess. I’d only been on my boat a couple times, so finding my rhythm was a bit tough. However, I clawed my way through a few more spots passing some friends in kayaks as well. No clue where I was now in the ranks, but I was having fun. At the far end of the lake, we had an out and back bushwhack up a stream to grab a CP. About 3k running total. This was a great way to see the gap between me and other teams. I think I was about 10th in this area, and the leader had probably 20 minutes on me already! Luckily, it was a really easy CP, and I was trotting back to the boat for the return paddle in no time. Lots more teams now beating the trail down, but I should be able to stay ahead. I made up a couple more spots on the paddle back, in time for the final real transition. Section 3 was the crux of this race. To avoid the logistics of gear transfer, the race organizers laid out a big mountain bike leg, with the next trekking section in the middle, but with no access to gear. As such, you had to bring enough ‘stuff’ to last the rest of the race. That included the advanced section with extra biking on some slower trails. I had only a small pack, but with 2 full bike bottles, 1.5L of fluids, and food, and a Boost meal replacement (I love those in races! ), I was off. I had also strapped 2 shoes for the trek outside my small pack, being held in place with an elastic. Bad decision. I took off from the final transition in hot pursuit of the phantom racers ahead of me (it’s always hard to know how close or far you are, but anything can happen!). I had plenty of time to make the advanced section, so that decision was easy, and I took off for remote checkpoint CPA at the north end of our maps. From there, it was a long and often times frustrating bike slog through very mushy ground. I will say however that with the 29er, I was extremely pleased. I was able to roll through a lot more things on that bike. I made it to the final trekking section just as the leader was coming out. Apparently, he hadn’t gotten either of the 2 CPS in the bush. So, as long as I got at least one of them, I would be ranked higher. There were a couple other teams there, and we opted to work together a bit to try and get ahead of others. Oh yeah, and the shoes? Well, one had fallen out somewhere along the way, so I ended up doing the whole trek in bike shoes again! Although they were not easy, the CPS were definitely findable, and we made it out in what we felt was pretty good time. This seemingly short trek would prove to be the turnaround point for many. Those who succeeded were rewarded at the finish. After the trek, I hopped back on the bike, and tore out hard racing for the finish. I felt strong so I left another solo racer at this point to see if I could pass more teams. I did pass teams, but at this point, it was hard to tell if they were on regular or advanced course, so it may or may not be helping my position. As you read from the opening paragraph, you’ll note that my efforts paid off, and I was extremely pleased with my strong finish in a tough field. Although not good enough for a podium finish, this was a strong placement and has given me high hopes for the next race (yes, that’s foreshadowing). At the finish line, under a bright sun, I hung out and ate junk food with all my racing friends. It was a glorious day, and Deanna and much of her family had also come out to volunteer at the race, so it was a lot of fun. The whole race went without a hitch, until the awards later that night, when a snafu with the electronic results system meant a long wait for final standings. That was of no concern to me by that point, as I had other exciting news to talk about and share. But to learn about that news, you’ll have to read another blog post :-). Here’s a hint: Why would Deanna’s folks be at a race?? Stay tuned for the full story there. Next up, Storm the Trent near Tweed, Ontario, another 6-9 hour race. Yippee! Summer is here! To close off, have a look at the race video review that I put together for Get Out There below.